WHAT IS HENRY COUNTY HUMANE SOCIETY – GENESEO? The Henry County Humane Society – Geneseo is a small, NO-Kill Animal Shelter. As of February 2008, we share the building with the City of Geneseo’s Pound facilities. Our section of the building has four (4) dog kennels and a large cat area where the kittens and cats live in commune style. 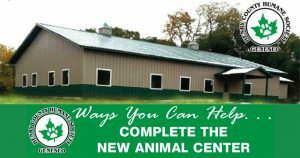 Our Humane Society is a 501(c)(3) non-profit agency located at 14606 Roos Hill Road in Geneseo, Illinois , and is operated on donations from the public. All donations go directly to help with care of our animals while we look for a permanent home for them. We have five part-time employees that have the responsibility of keeping the shelter clean. The rest of the shelter work and fundraising is done totally by our volunteer organization. We are a growing group of caring volunteers. If you would like to help with the hands-on care of our Shelter Orphans or assist with the fundraising needs of the Humane Society, please call the Henry County Humane Society-Geneseo anytime at 309-944-4868 . If you get a recording, leave a message and we’ll call you back as soon as possible. We strive to be a passionate advocate for the lives of companion animals by finding quality homes, providing community education, and promoting responsible animal ownership. 501 (C) (3) No Kill Shelter. Video Appeal for contributions to support the new shelter.